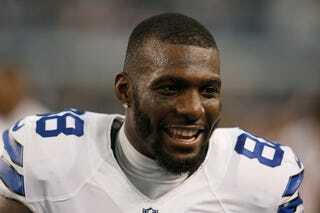 Dez Bryant will soon be a free agent, after the receiver failed to agree to a new contract with the Cowboys. Why would the team be so hesitant in locking up one of the best pass-catching threats in the league? If you believe rumors, Bryant did something on video that's bad, but no media outlet's actually found the video yet. ProFootballTalk's Mike Florio was on 105.3 The Fan while radio duo Shan & RJ briefly talked about the video. Florio jumped in to say he had also heard the rumor. According to him, "all of the major insiders" have known about this video for months, but they can't get their hands on it. You can listen to the conversation here. Florio also said the Cowboys were afraid this "incident," if released to the public, would have a "Ray Rice-type of an impact." But there aren't any details of what Bryant did. It's all quite vague and weird. As for the team maybe knows about this video, COO Stephen Jones told Mike Fisher of CowboysHQ.com that it's false.